Well it’s the end of the working week and I have a big weekend coming up. One which will include very little sewing which is just the way I needed it to be after a mammoth few weeks getting stock sewn up and ready for last weekend’s Bobbin & Baste market stall. The market stall I had in Manly, my beachside home, was a success and I really enjoyed running it. The best part of doing a market stall for me is to think that I have hopefully had happy customers who now own a piece of Bobbin & Baste in their home. I just wish I could spy on their homes to have a look! I still have two more stalls to go until the end of the year and then I will assess whether or not it is something I will do into 2015. Whilst I enjoyed it on the day, it is a lot of work and the reality is, you don’t make back in money the hours you put in. It’s very much for the love of it. Pics from my stall last weekend are on my Facebook page here. I have been neglectful of my selfish sewing and my blog is a bit dusty but here is one dress I sewed up a couple of months back. I jumped on the Emery dress bandwagon and I’m glad I did. I saw this dress pattern aaages ago and thought it pretty well looked like a lot of other patterns you can buy and not all that different to the aesthetic of stacks of other dresses I have made previously – read vintage inspired. But there was a sale and I couldn’t help seeing that as a sign from the sewing gods that I should give this pattern a go. I had spotted a ‘Atomic’ patterned fabric on Etsy a while back and thought this dress could be a good match for it. I lurrve working with quilting cottons. If you’re interested it’s from Michael Miller fabrics and if you go onto Etsy and type in Atomic fabric you should be able to get a hold of some of it. I cut out the dress in a size 8 and the sleeves I graded out a little bigger as I always find them a little tight. I also added about 1.5 inches to the skirt bottom as I wanted it to end just under the knees as I plan on wearing a crinoline underneath this most of the time. You can add a cute collar to this dress but after having just made this similar dress with a collar I chose to go without. The bodice for this dress is lined so I bought some cotton voile for the lining in white. 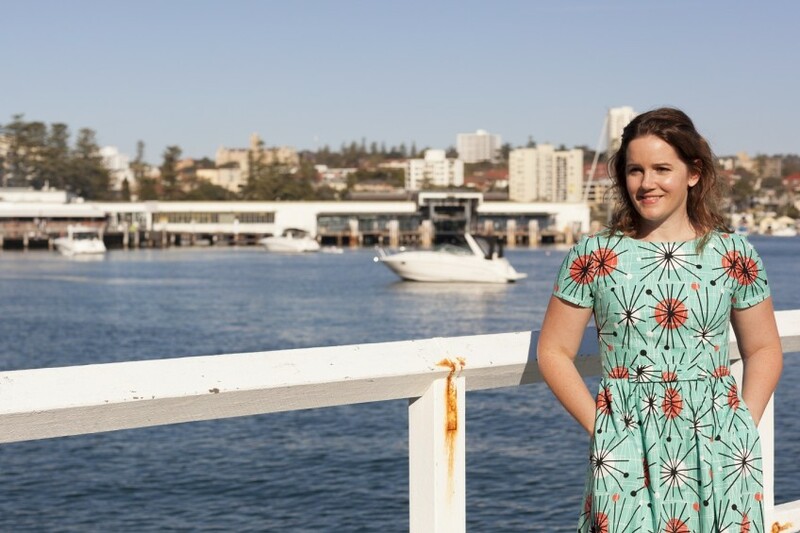 Cotton voile is a great option for lining dresses as it breathes better and is more comfortable – I find this pretty important during an Australian summer! This was one of those great sewing constructions when very little fitting issues occurred. I am always relieved when that happens given I don’t do mock ups of dresses in advance as I am too impatient to just get stuck right in. I had to take the dress in a touch at the waist but otherwise it was perfect. The sleeves were a little trickier and I had to take them out even more as I wanted them to have a little more give. I will say, Christine has done a fabulous job with this pattern, the fit is great and for once it’s a dress without stacks of ease. This dress was the first I have done in which you applied the lining by machine sewing it along the invisible zipper. I find most patterns ask you to hand stitch the lining down towards the end of construction. When I first read the instructions I was a little perplexed as to how to do it but once I got my brain cells working in unison and did it I am so happy with the outcome. It makes the finish at the top of the zipper clean and I love looking at the inside of my dress.It's very fancy pants. I think overall mine version of this fits really well but almost like a glove so I think I could have made it a bit looser overall. It’s especially noticeable after a big dinner! I first wore this dress to a gig in which the band played a stack of retro songs so I felt it very suitable for the occasion. Check out Furnance & the Fundamentals online, they are brilliant! This reminds me of the Jetsons and that's just awesome. It's really great, I do like the minty background on you. Suits you very well. Super cute dress! I love Michael Miller fabrics. What a gorgeous dress. So love the fabric. Thanks Stephanie. :) You should absolutely make this one, its a great fitting pattern. I'm going to make another with the collar on it me thinks. Gorgeous as always Bec, quilting cotton is perfect for a dress like this and the pattern options are endless!! Thanks Emma - I do love quilting cotton for summer dresses and you can go nuts with choice. PS - Totally copying you at the moment and making a Cynthia Rowley top, loved yours! This is beautiful! Thanks for making my pattern and for sharing your results! Love it! Thanks Christine - it's a great pattern! I have this pattern also but have not yet cracked into it. There's a lot in there that scares me...zippers, lining, fitting wovens! All of that aside it looks really lovely on you...the pattern is AMAZING and I love that it fit right of the bat pretty much. Do you happen to recall where you bought your crinoline?